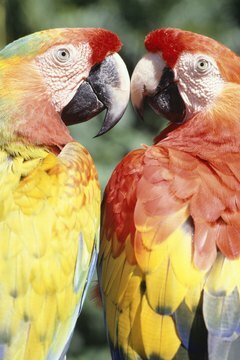 Macaws show off their impressive, colorful plumage. Poor diet is generally the primary cause for poor plumage or self-induced feather damage; if you notice either circumstance, you'll want to consult with your avian veterinarian. They could be indicative of vitamin deficiency. The dietary needs for birds vary by species and situation, and you need your vet's input before you give supplements. The best vitamins are the natural vitamins found in fresh food. Perhaps the single most important vitamin for maintaining songbirds' full, colorful, healthy feathers is vitamin A. Not only does this vitamin support skin and feather health, but it also plays a part in the vibrant coloring of red, orange, yellow and blue pigmentation. Your bird's best source of vitamin A is through fresh foods, since too much synthetic vitamin A can be toxic. Natural sources for this vitamin include apricots, broccoli, carrots, parsley, peppers -- red, yellow, sweet and bell -- squash and spinach. Another vitamin most companion birds lack is vitamin D3, which is vital to maintaining healthy, bright feathers. The best way for your bird to get his daily dose of vitamin D is through exposure to unfiltered -- not even window glass -- natural light or through the use of a full-spectrum light specifically made for birds. It is possible to for synthetic vitamin D to become toxic to a bird, but it is impossible for him to overdose on light-sourced vitamin D. When allowing your bird access to unfiltered light, guard against dangers such as predators, escape and other hazards. Provide a shady spot where he can escape the light if it becomes too hot or too bright for him. Usually about 30 minutes of light per day will provide him all the vitamin D the bird needs, which will in turn help keep his feathers bright and healthy. Vitamin C deficiency has been directly linked to feather-destructive behaviors such as over-preening, barbering or chewing the ends off the feathers, plucking and self-mutilation. If your bird exhibits any of these behaviors, his environment should be evaluated in addition to his diet to ensure they aren't being caused by boredom, tiredness, or another underlying medical issue. Natural sources of vitamin C include broccoli, cherries, guava, kiwi and peppers including red, sweet and bell. When adding fresh fruits and vegetables to your bird's diet remember to limit them to 10 percent to 15 percent of his total diet. Most seed-based diets are deficient in vitamin B. If your bird lacks any of the family of B-vitamins he may exhibit poor skin and feather quality. A deficiency in the B-vitamin riboflavin has been associated with abnormal yellow coloring. Normally, B-vitamins are produced in your bird's gut. If he isn't getting the nutrition he needs to generate these vitamins for himself, you can add some boiled egg to his diet. Most good sources of B-vitamins are animal-based; egg is the most suitable source that his digestive system can handle.